Evangelising is an ugly thing. It assumes indisputable truths, and limits the field of inquiry. Its very assertiveness lies in unquestioning rather than probing, a sheepish acceptance of the truth. The tele-pastor and media choked evangelists, of which the United States became famed, had a figure who was, for much of his time, without peer. 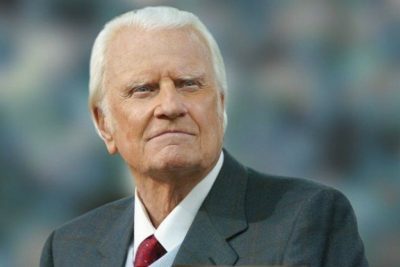 The late Billy Graham, who died on Wednesday at his home in Montreat, NC, received packed audiences in gatherings of orgiastic religiosity. His was a crusader beamed via satellite, a religious demagogue attuned to mass media. The enormity of his reputation was belied by his lack of ostentation. He dressed simply; he eschewed scandal. Admirers pondered about his appeal, his ability to traverse partisanship and avoid the stain of naked populism. One grand stumble in his calling (or was it a step up?) in the lower reaches of this kingdom in associating with that most morally challenged of US politicians. With an element of the night about him, President Richard Nixon formed something of a duo with Graham, tantalising him, flirting and encouraging. Nixon even suggested the possibility that Graham take up the post of ambassador to Israel. This is all the more fascinating given the insistence by the preacher that pornographic Jews were dominating the media and would ultimately send the United States “down the drain”. “They’re ones putting out the pornographic stuff,” huffed Graham to Nixon, insisting that the “Jewish stranglehold” had to be “broken”. To each audience, the appropriate fable. For Graham, Jews were friends, attempting to cultivate him with a certain relish, encouraged by what they perceived to be his friendship with Israel. But discomfort reigned. Disappointment with their power could be contrasted with his own lack. Having “no power, no way to handle them” he would wait to “stand up if under proper circumstances.” Such is the nature of the preacher; the demagogue can turn. For Hitchens, Graham’s sermon at the National Cathedral after the attacks of September 11, 2001, “made the claim that all the dead were now in paradise and would not return to us if they could. I say absurd because it is impossible… to believe that a good number of sinful citizens had not been murdered that day”. Such is the economy of sin. The approach from those who assess his legacy in US politics and religion with a softer hand prefer the virtue of the flaw over the insistence on perfection. For Nancy Gibbs and Michael Duffy, authors of The Preacher and the Presidents, Graham was admirable. Finding fault was easy for him; self-examination was constant. But that was the penitent showman, aware of playing up to his role. A flawed religious leader is bound to be more appealing than the rabid perfectionist. As an insurance policy, it is unmatched. What is ignored in the assessments of Graham is the modern dilemma of US politics, its proximity to the same God that the Founding Fathers pondered over with mixed affection. The secular keeps company, if not hugs, the religious in an at times disturbing embrace. Depending on the presidency of the time, prayer breakfasts will intrude upon more earthy deliberation. Advocates for Darwinism must battle fervent creationists. To that end, Graham’s mighty influence simply affirmed the US republic in its more idiosyncratic guise: the enlightenment keeping company with the divine.